I just returned from the ESRI 2012 Users Conference. As always it was jam-packed with good content about the upcoming 10.1 release of ArcGIS. The plenary, keynote and sessions were all very good. Some weak moments in the afternoon of Monday's plenary, I thought, but not too bad. One of my goals for the conference was to not walk myself to death as I've done in years past. Usually I'll walk down to Seaport Village a couple of times to have lunch, a ten minute walk each way. This year I came across a food truck right outside the center, that was serving really good Mexican food, so I had an authentic burrito there instead. Supporting the local economy, saving myself a few bucks and a little walking. Nice. 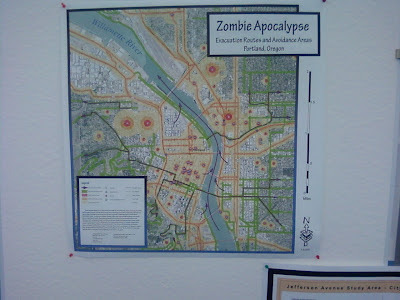 One of the maps in the map gallery was the map above showing the evacuations routes in the event of a Zombie Apocalypse in Portland, OR. It was an application of GIS I'd never actually considered before. It's good to know that someone has it covered. I'd better get on that for the Waukesha area, especially given our location near the Prairie Hill Cemetery. I don't need Les Paul or former city Mayors showing up on my lawn anytime soon, and if they do, I need to know where to go, and where to avoid. 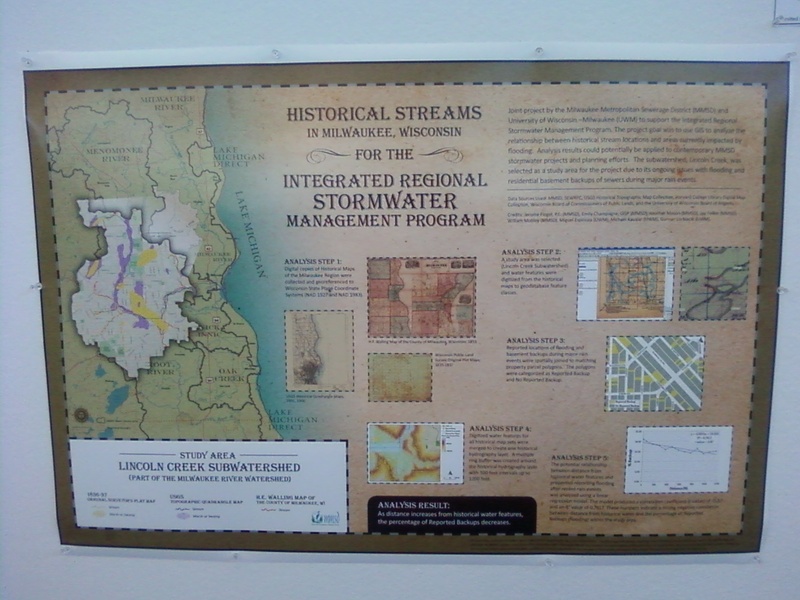 Another notable map was the one from Milwaukee Metropolitan Sewerage District (MMSD) which was put together by a friend of mine and her team of interns/part time student help. A great looking map with a historic cartography look to it. (Thanks in part to Photoshop.) The map is shown below. On top of all the maps, apps, technical workshops and exhibit halls, there was almost nonstop opportunities to network with my peers from far and wide. Our business (GIS) is unique and obscure enough, that it is so nice to be able to talk with others about the successes and failures of their various systems. It is invaluable, and I am so lucky to be able to attend every year. I can't say enough about San Diego as a city. The weather is always amazingly comfortable. It seems even in full sun, that the sun isn't as hot or as intense as it is up here. This can be dangerous, because its probably the same or worse. We came back to decent weather in Milwaukee, 80 and partly cloudy, but it was windy and humid. When San Diego gets 80 degrees, it doesn't come with the intangible wind and humidity. You might say "pleasant with strings attached." I'll keep this short, as the jet lag is kicking in. 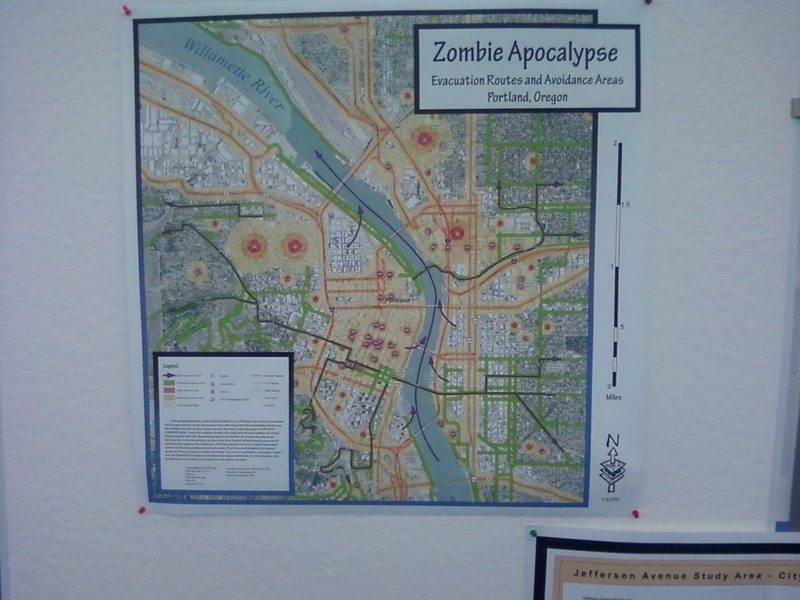 I had a grad student who was going to do project for my class involving zombie analysis for Waukesha. He never finished the semester (actually he dropped out of school all together).